blushing basics: Eucerin Beautiful Skin + Giveaway! Eucerin Beautiful Skin + Giveaway! the first week of every month is officially devoted to skincare for 2013. skincare is something that i am passionate about and i find immense importance in taking care of your skin. with so many damaging forces that are unavoidable, the steps you can take to guard and protect your skin are critical. there are three key words to describe healthy looking skin: hydrated, clear and glowing. listed below are some steps you can take to make sure that your skin is hydrated, clear and glowing. in your 20's: this is when you begin to develop the skin care habits that will stick with you throughout your life. try to avoid tanning beds and smoking as these are the main causes of wrinkles later in life. apply a daily moisturizer with a broad spectrum SPF to keep your skin protected. you can get a free sample here. in your 50's: while the skin on your face is always a concern, one area that is neglected are your hands. your hands are exposed to harsh elements daily and from scouring the bathtub to hot water from the kitchen sink, this exposure can wear on your skin's repair systems. those that suffer from damaged, cracked and dry hands are more likely to develop dermatitis or eczema. using a hand moisturizer like Eucerin's Intensive Repair Hand Creme will help protect dry, rough hands. Eucerin is a brand that i trust and that i know to work. you may or may not know that Tman (my hubby) is an allergist and recommends the soothing properties of Eucerin on the daily. if you want to find out more about what products you should be using, visit the Skindicator App on Facebook to receive a personalized recommendation from the Skin First Dermatologists. i visited the Skindicator App on Facebook and found out what Eucerin products were recommended for me. recommendations included a moisturizer with an SPF - a must for the dry (but sunny) Denver climate. 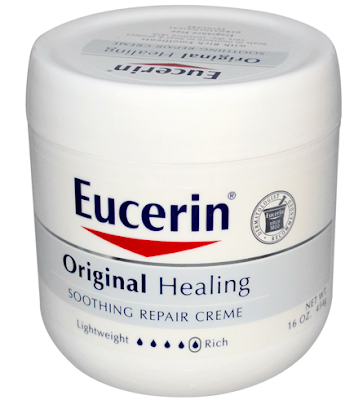 i also picked up some of Eucerin's Soothing Repair Cream to lather myself, and my kiddos, with daily. it makes all the difference in the world between itchy, dry skin and soft hydrated skin. don't forget to join Eucerin and myself for a Twitter chat today at 4pm EST for a chance to win even more prizes. *as a member of Eucerin's Skin First team, products included in this post & giveaway were sent for review by Eucerin, all opinions are my own. Hey girl--loved your twitter party yesterday!